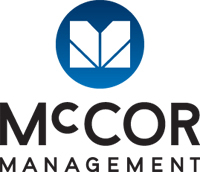 McCOR Management (McCOR) are delighted to announce that the company will be taking on property management for Slate Asset Management LP’s (Slate) recently acquired properties in western Canada. McCOR (formerly NewWest Enterprise Property Group and High Peak Group of Companies) is one of Canada’s largest privately owned development and property management firms with over $3-billion in assets under third-party management. This monumental deal arose after Slate Capital Corporation’s (affiliate of Slate) recent acquisition of all outstandingHuntingdon Capital Corp (Huntington) shares. Slate also assumed the management of FAM Real Estate Investment Trust (FAM REIT). All Huntington shares were delisted from TSX on November 7, 2014. Along with its roster of other multi-provincial clients, co-founders Doug McDonald and Luc Corneli will lead theMcCOR team in managing Slate’s assets. The portfolio includes a mix of retail, industrial, and office properties. “We chose a company with a proven track record that could compete at a national level and offer a hands-on approach,” said Brady Welch, partner and co-founder, Slate. “We trust McCOR Management and its team of experts to provide property management services for the assets,” added Blair Welch, partner and co-founder, Slate. While it is in line with Slate’s business model to retain external property management companies, Huntington self-managed its properties. As such, McCOR has offered and concluded 32 continuous employment agreements with former Huntington employees to ensure a seamless transition for employees, tenants, and clients.